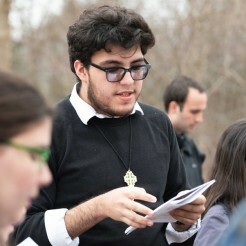 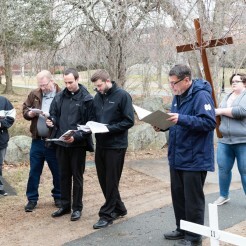 During Lent, Catholics participate in the Stations of the Cross, a 14-step devotion marking Jesus’s last day on earth. 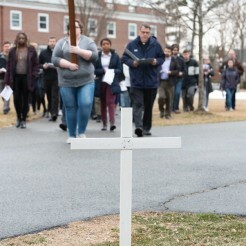 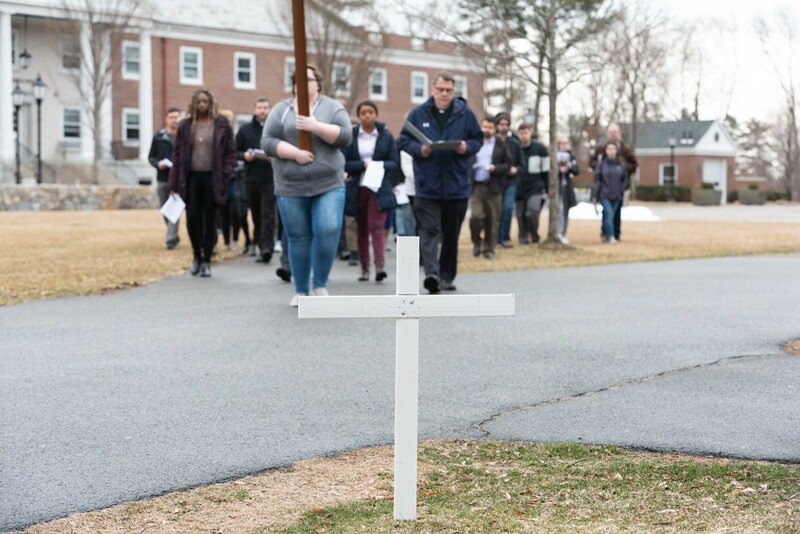 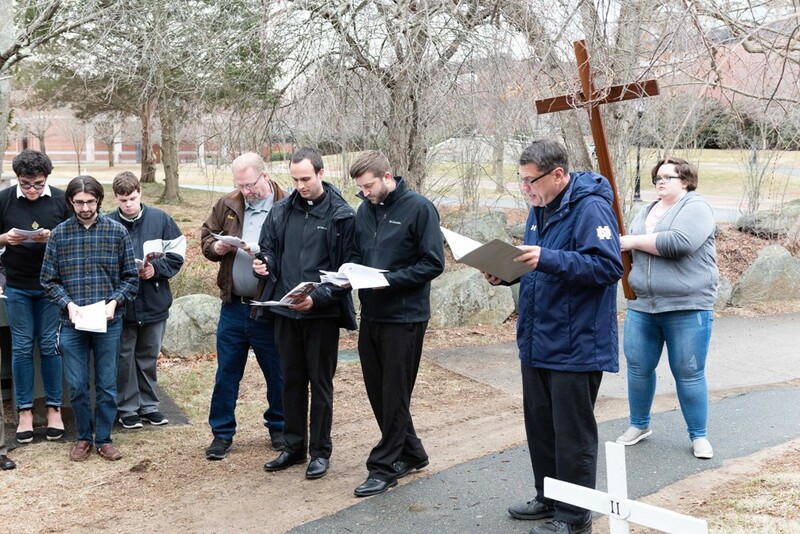 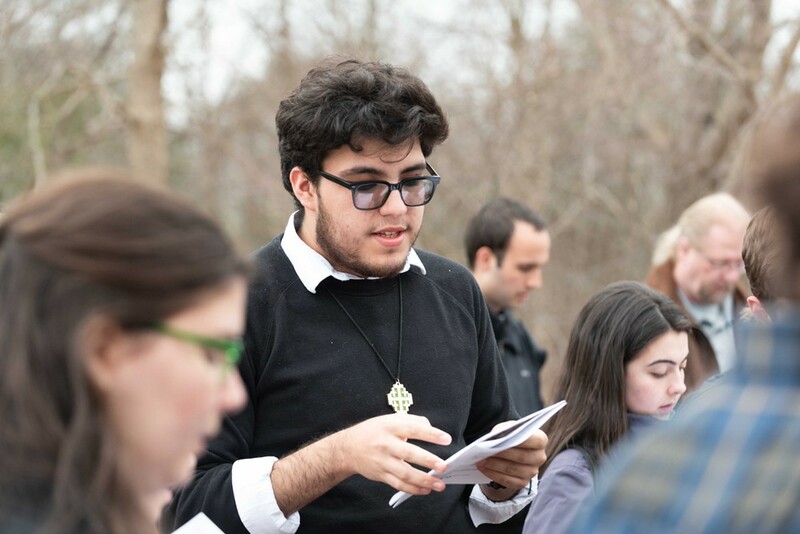 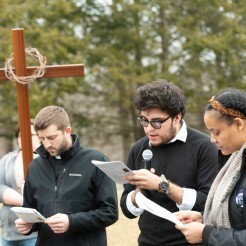 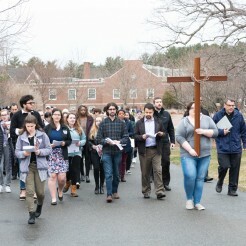 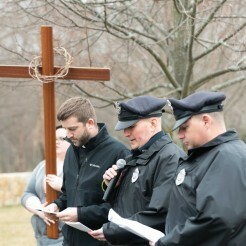 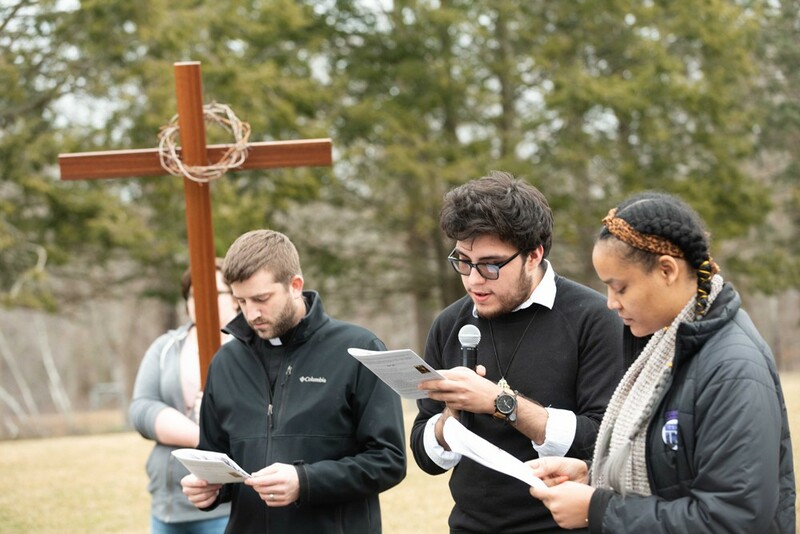 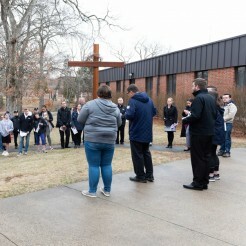 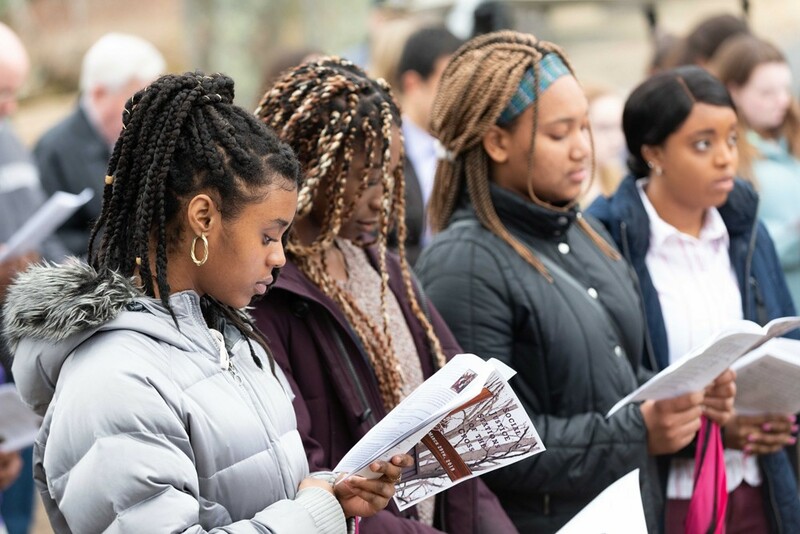 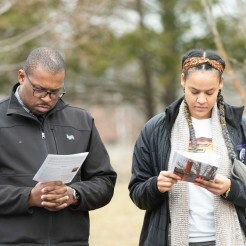 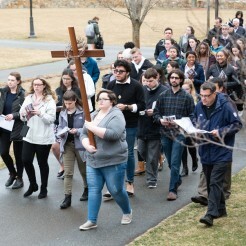 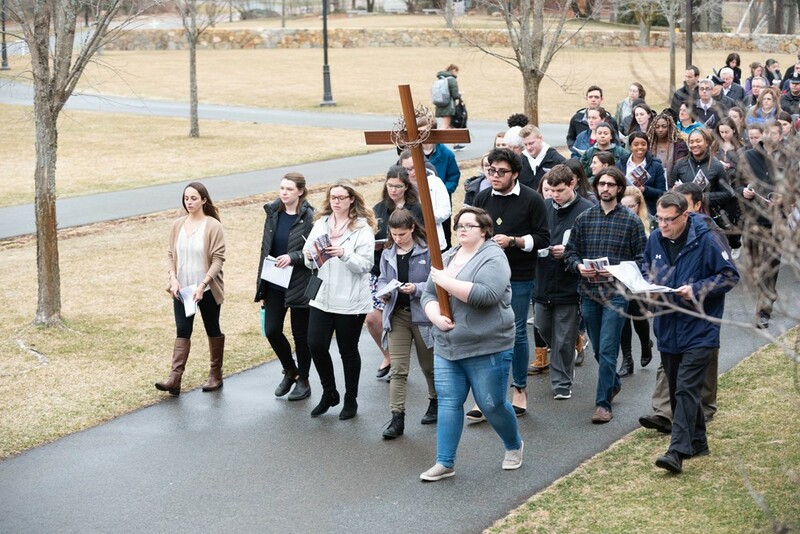 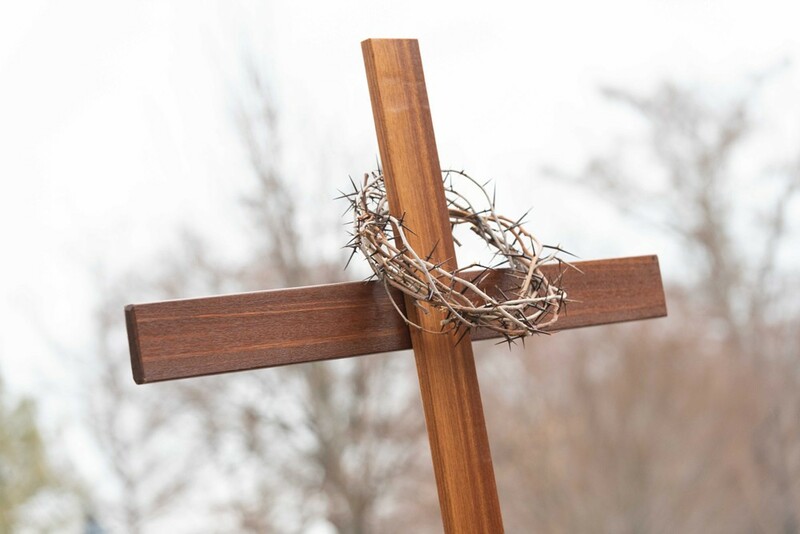 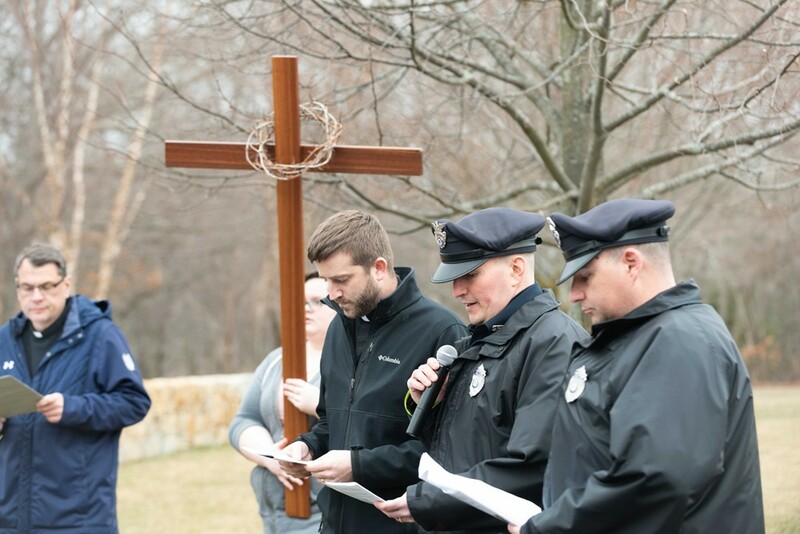 At Stonehill, the Stations, organized by Campus Ministry, have a social justice theme and, on Friday, March 29, participants walked the main quad, stopping at each Station marked by a white cross to reflect on the trials that Jesus endured and their example today. 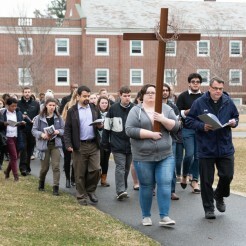 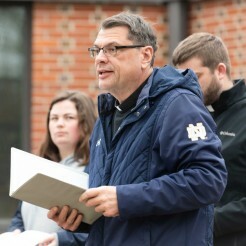 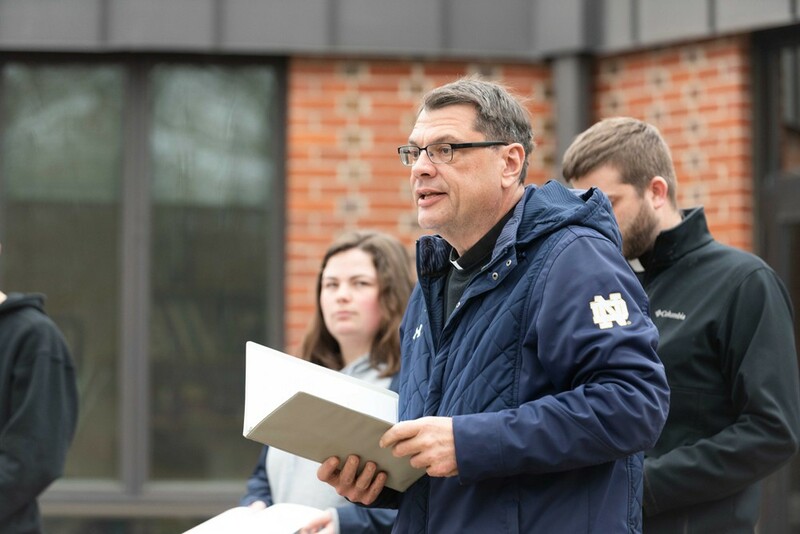 The event is designed to “pull in people from all parts [of campus] to show how we’re all working to alleviate each other’s burdens, much like the burden of Christ’s cross,” said MaryAnne Daley, the Assistant Director of Campus Ministry. 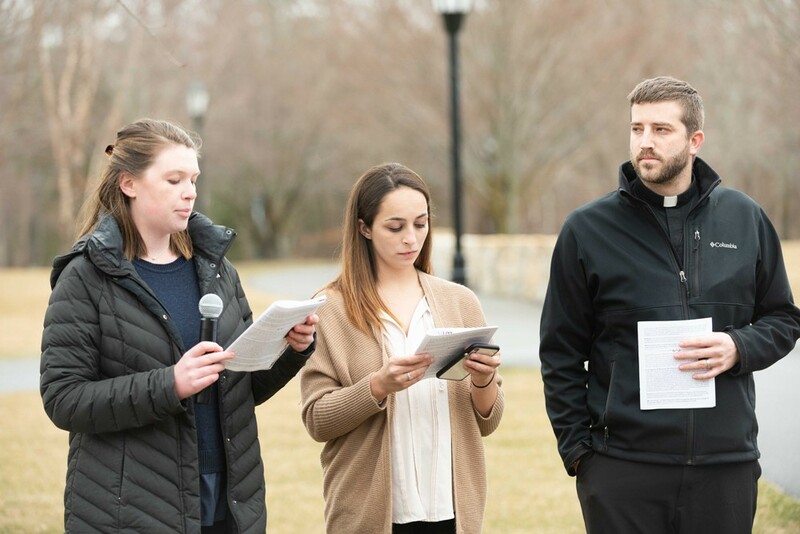 Emily Rowland ’19 with the disABILITY Enlightenment Project, spoke about rising through hardships. 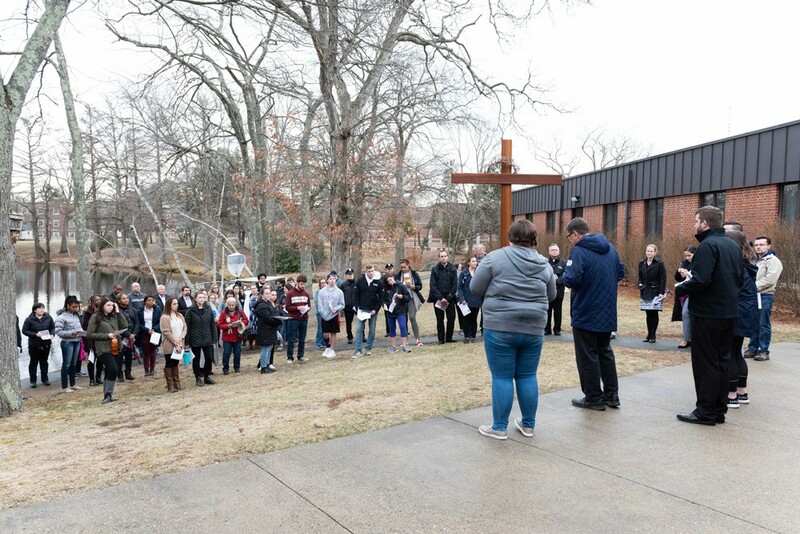 “When others fall, we need to help them rise, not knock them down with derogatory, humiliating, or stigmatizing words and actions,” she said. 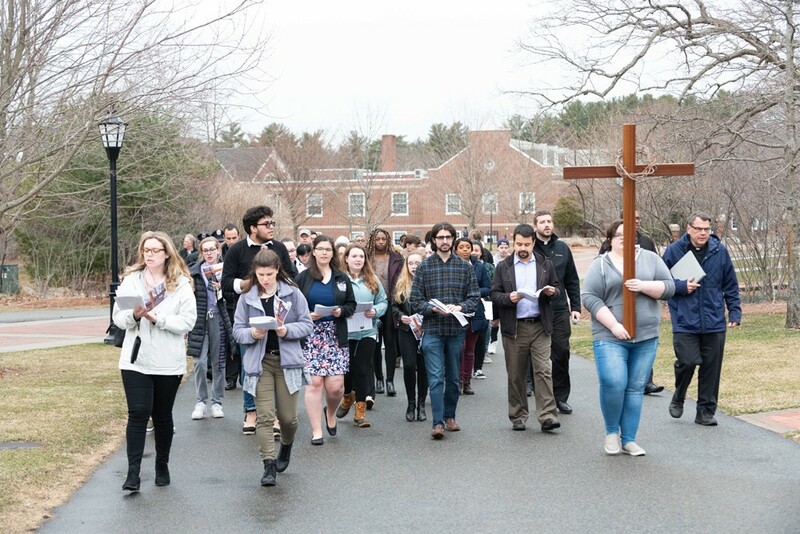 “It was a pleasure to be amongst everybody here… and the feeling that it gives you to be loved at Stonehill College. 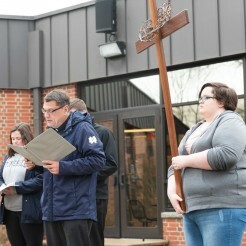 It was a very spiritual moment to be part of this,” said Custodian Rob Andrews said about getting involved with Campus Ministry. 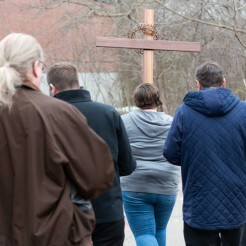 “We may never have to walk the way of the cross as explicitly as Jesus did that day, but we each have our own daily crosses to bear,” added Andrews. 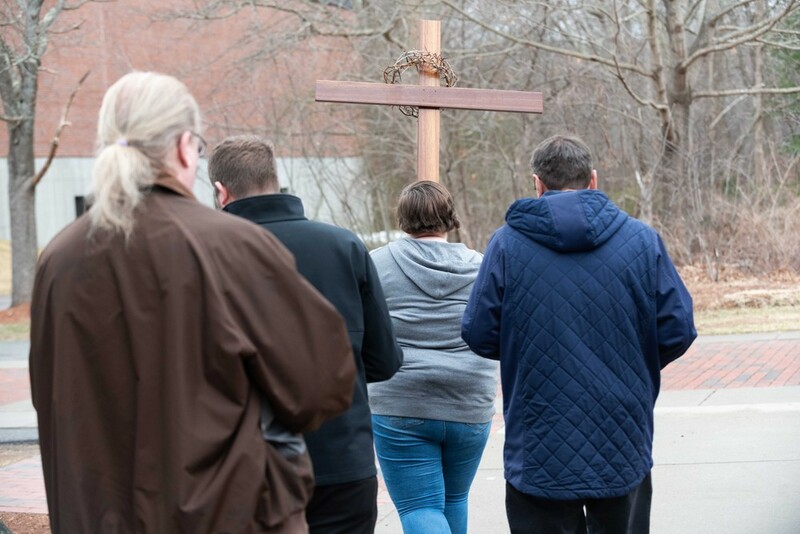 “Love will journey with us through our suffering and encourage us to live each day authentically, knowing that we are all made in the image of God,” said Patrick Hale, Assistant Director of Intercultural Affairs, who represented the LGBTQ+ Employee Resource Network. 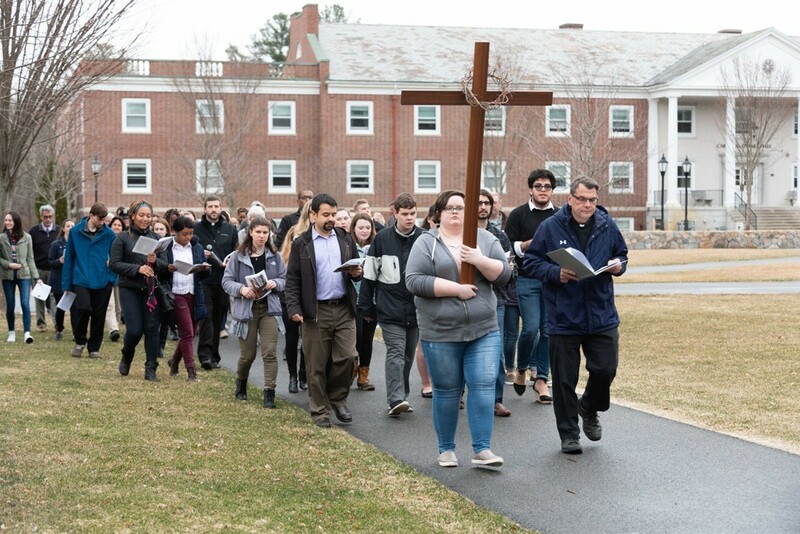 “As student-athletes there are times when the pressures in the classroom and athletic arena get overwhelming and painful but just like Jesus, we must stand strong and persist,” Maddie Fernbach ’19, a student athlete, said. 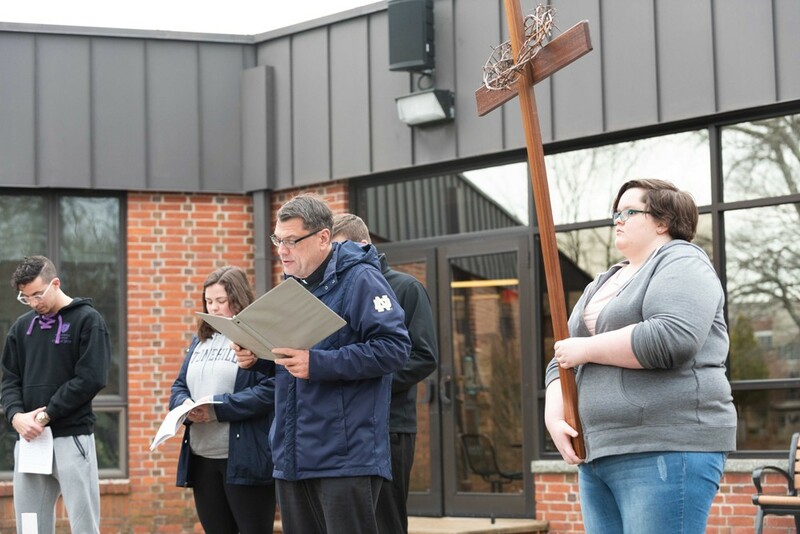 “Our leadership team will lead most powerfully when we show the same respect and dignity for others that Joseph of Arimathea showed for Jesus,” said President John Denning, C.S.C. 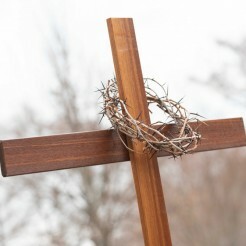 of the man who took such care in burying Christ after his crucifixion. 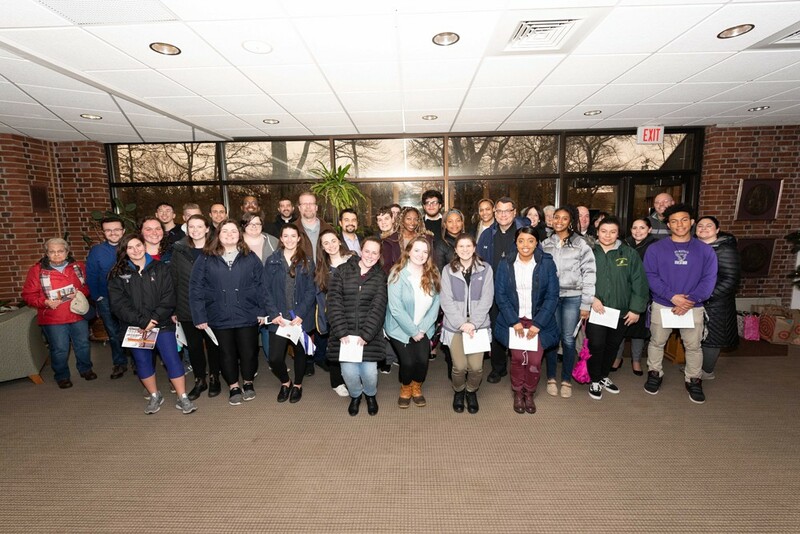 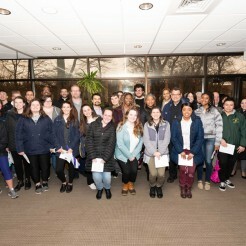 The participating groups were: Student Government Association – Executive Board; Facilities Management; Disability Enlightenment Project; Social Justice Housing; Campus Police; Faculty Senate; Athletics; M.A.T.U. 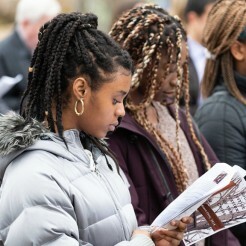 (Mundos Apartes, Tierras Unidades); Afro-Caribbean Club; LGBTQ+ Employee Resource Network; H.O.P.E. 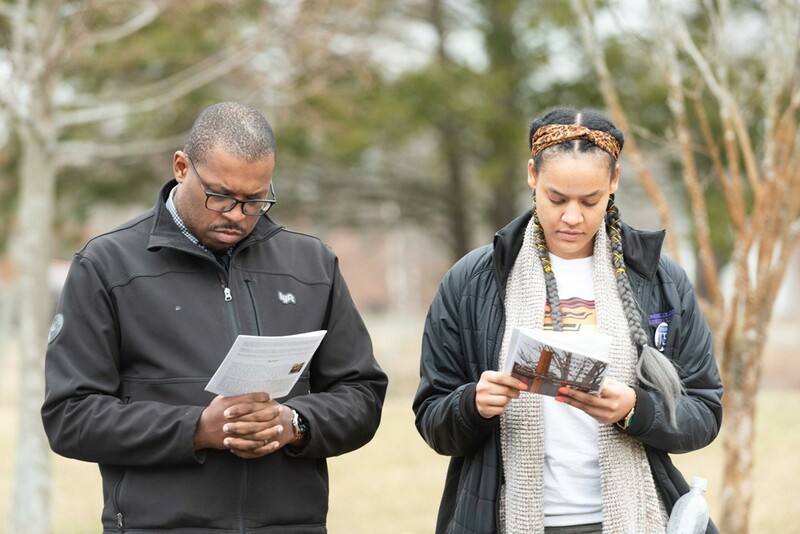 (Honoring Our Neighbor, Organizing for Justice, Practicing Peace & Encountering God); Community Engagement Program; Institutional Diversity Action Committee; and the College's Senior Leadership Team.